This 2015 Fender Custom Shop 1963 Stratocaster features a deep-contoured alder body with an Olympic White lacquer Relic finish. Tone comes from three hand-wound ’60s Stratocaster single-coil pickups (reverse wound/reverse polarity middle pickup) with modern five-way switching. The guitar also features a quartersawn maple neck with a comfortable ’60s oval C profile and small headstock, 9.5″-radius round-laminated rosewood fingerboard with 21 narrow jumbo frets, a three-ply mint green pickguard, vintage white control knobs, American Vintage bridge, and American Vintage tuning machines. A nice complement to my 2011 Custom Shop Strat. This 2011 Stratocaster Pro is made by the folks at the Fender Custom Shop. The guitar is fashioned from 100-year-old pine and finished with nitrocellulose lacquer over a copper colour. The neck is quartersawn maple with a large “C” back. The maple fingerboard holds 22 frets with a 9.5 inch radius and 6100 frets. Sound is produced through Master Design pickups with 5-way switching and no-load middle/bridge tone control. A Lake Placid Blue Gretsch 6128 Duo Jet built by Stephen Stern at the Gretsch Custom Shop. Stephen Stern arrived at the Fender Custom Shop in 1993 and has led the Gretsch Custom Shop since 2005. Beautiful instrument to play although a tad susceptible to feedback at higher gain. After failing to bond with my Collings CL Deluxe, I decided to trade that guitar for this gently used Collings Eastside LC. I plan to spend a lot more time developing my jazz chops and this is certainly a fine instrument for the job. I picked this one up in 2017. This was my first good quality electric guitar. I bought it second hand for $300 in the late 1970s. It was played hard back then as I was actively touring and recording all around Canada and the United States. Despite the work on the road and over 36 years of service, the guitar looks almost mint. This guitar does get played from time to time but usually only at home or in the studio. I really, really wanted a Gibson ES-335 guitar. My guitar hero at the time, Larry Carlton, played one. That was reason enough for me to begin my search. However, Gibson in the 1980s was not producing really great guitars. I could not find one that would sing. My local guitar shop suggested that I try the new Ibanez Artist Series guitar. Nice instrument. It stays home for the most part. This particular model year is highly valued and I can see why. It is a remarkably well made instrument for the period. The Tom Anderson Drop Top is a boutique Super Strat. Great sounding guitar and I used to play it all the time. Very versatile. I was stuck between single coils and humbuckers so I bought another HSS guitar. After I finished touring I sought to establish a new career in business and technology. When I became an executive at a large financial services organization, I rewarded myself with my first “boutique” guitar: a Paul Reed Smith Custom 22. I have a few friends who think that this guitar is the best one of my collection. However, for me, it is a nice guitar but not a great guitar. It does the job but rarely goes out on stage anymore. This is my second hollow body Ibanez, the Artstar AF155. I love to play jazz and, in another decade or so, I may get to a level where I can justify a higher-end jazzbox. But, for now, this one is not holding me back. Wonderful, woody tone for jazz. This one was a terrific find. A Chinese Tele that plays well and sounds pretty good especially for the low price. A perfect guitar for a student just starting out or for an accomplished player who needs a low cost guitar. I take it out when the venue might be harsh on a wooden instrument, such as hot, humid summer days. Matthew and I worked on this guitar for a school project. Matthew did almost all of the work on the guitar including the paint, much of the woodworking and most of the electronics. We do need to take the guitar in for a tech to do the final setup. It holds a special place in my guitar collection. I used to play a lot of bass years ago and I picked up this Fender American Jazz Bass along the way. I don’t remember when but I have had it for a few decades for sure. This is one incredible acoustic guitar. The square-shouldered 14-fret dreadnought is a very popular design. Collings brings such depth and warmth of tone. I have not played a better sounding acoustic. Ever. I bought this guitar new at Steve’s Music in Montreal. That was, ahem, 43 years ago. I took it with me everywhere I went. I believe it has gone out to my oldest son along with another of my acoustic guitars. Well, at least it is still in the family. I was getting asked to sub in on acoustic guitar from time to time and I decided I needed an acoustic with a built-in pickup system. My 1972 Guild D-40 was not engineered for the stage. The Taylor is a bright and willing acoustic and does its job well. It has the feel of a mass-produced instrument — certainly functional but it seems to lack the soul of some of the other guitars that I own. However, it too has made its way to my oldest son. The Line 6 Helix Floor has become my go-to modeller for most of my playing. It literally is a full-blown rig in a box. Light in weight but potent in tone, I find it takes me most of the way to the old analog rigs I used to play. It offers an incredible workflow, a wide range of effects and amps, and, perhaps most importantly, it sounds good. This is what I am using for most of my playing these days. 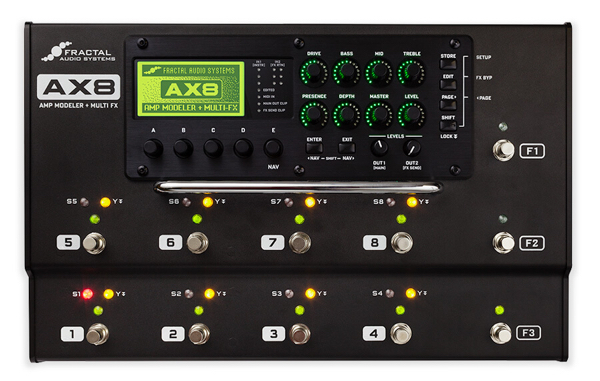 The AX8 is an all-in-one Amp Modeler + Multi-Effects Pedalboard Processor. 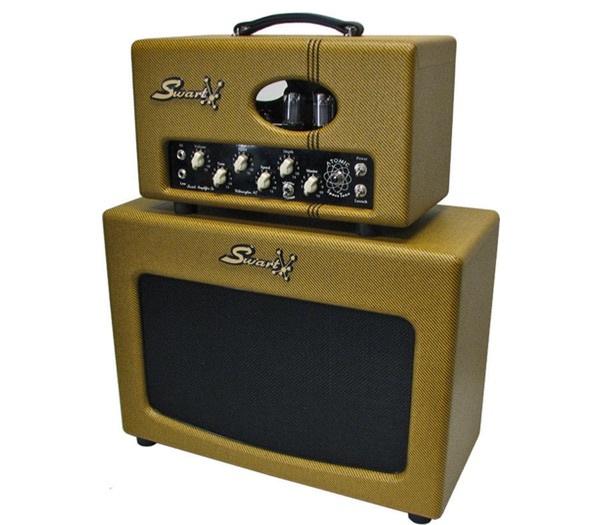 The AX8 holds over 222 modeled amps that recreate the tone and feel of real tube amps. Speaker simulations offer a range of cab tones, with 130+ Factory cabs. Add to this a great selection of effects: drive pedals, reverbs, compressors, delays, EQs, choruses, phasers, flangers, rotary, tremolos, pitch shifting, wah, and many more. The AX8 sounds great, with a pristine, high-quality signal path and the signal processing power that makes Fractal Audio Systems the industry standard for today’s most discriminating professional guitarists. 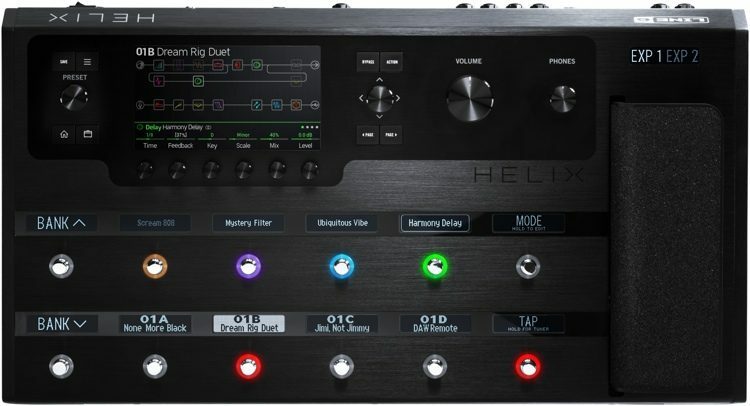 I still have the Fractal but I am using the Helix for most of my playing. 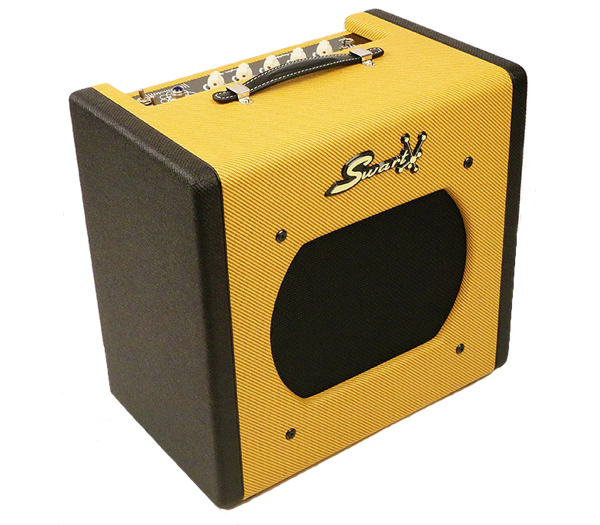 The Swart STR Tremolo is a 5 Watt amp with a terrific tremolo effect. Awesome tone that can be found at reasonable volume levels. This amp provides plenty of options for melding the clean tone, including a three-position EQ switch that can toggle between a natural clean tone, warm distortion and a fuzzier retro-styled tone. I have it loaded with a 6V6 power tube. I went with the limited edition AST tweed style. It looks really cool and it is about the size of a small tweed amp. It weighs almost 30 pounds. The AST MkII is Michael Swart’s take on a head and cab rig with 4/8/16ohm impedance selection, the ability to run the 6V6, 6L6, and EL-34, along with the addition of a completely bypassable dedicated tube stage master volume. The all aluminum, star ground chassis is housed in a hand-made , finger-jointed, solid wood cab, covered in lacquered tweed. I run the amp with 6V6 tubes. Sounds great. I use Dunlop Ultex Sharp 2.0mm picks. I buy them in bulk. I play D’Addario strings. 010s on the single coil guitars and 011s on the humbucker guitars. I also buy the strings in bulk. I use Lava cables for the pedalboard with soldered Switchcraft connectors. I use Evidence Audio instrument cables. I still use a Shure 57 to mic up the guitar cab. I use Pedaltrain pedalboards (PT Pro, PT 2, PT Jr). I use Voodoo Labs Pedal Power boxes to power the boards. I should buy them in bulk. I now use an iPad for my charts. I guess I am not too old school after all.